Find Everything you'll need within walking distance in the Downtown Shopping District of Fortuna, where locally owned businesses offer exceptional customer service! Downtown Fortuna is well known for sponsoring some of the best events that visitors return for year after year! You will be surprised at the treasures available while at Downtown Fortuna's yard sale on Main Street. 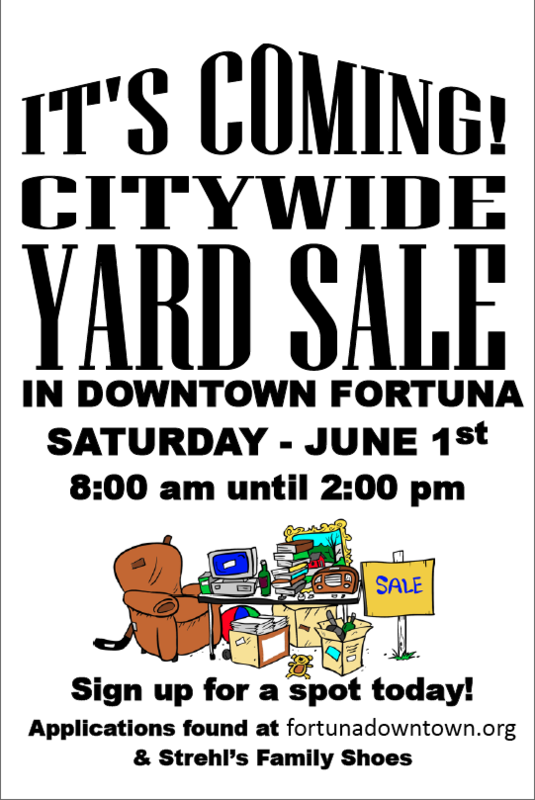 You can shop at 40 or more yard sales at one area in Downtown Fortuna. If you want to be a seller download this form. City Wide Yard Sale Coming June 1st - Get the application! We're Number ONE! Downtown Fortuna is in the heart of the California Redwood Coast, named by Lonely Planet as the #1 destination in the USA! Get details here. Copyright © 2019, Fortuna Downtown Business Association. • Powered by Precision Intermedia • All rights reserved.